But I'll be damned if that will stop me from trying! I have a lot of stuff that I'm in charge of. Or at least part of. When we decided that I would be a stay-at-home mom, I put my name on the imaginary line signing myself up it all. I may not have known at the time what exactly I was signing up for, but I was all in. None of it is easy. I never expected any of it to be. Right now my current hang-up is my crochet stuff. Since I first taught myself how a few years back, I have come across so many patterns I want to make. Some of those patterns are for things that no one I know would use or like, but it is too great not to make. That's why I decided a few months ago to open up my own shop on Etsy. For those who don't know, Etsy is an online market place where people can sign up and create their own virtual shop to sell whatever it is they make. Some people can open a shop and BOOM! Business. I haven't figured out how they do it, but I do know that is not the case for the majority of shop owners and I am in that majority. Have I sold things? Yes! Have I officially sold anything through my shop? No. And that is incredibly frustrating. Does that mean I should close the virtual doors on my shop? No. It means I need to keep on pushing. 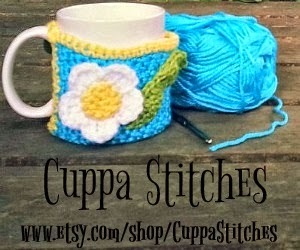 I recently started a Facebook page for my shop, Cuppa Stitches. I am always rearranging and rewording things in my shop and trying to add new items. Just like life, this takes work. Just like life, this is a constant learning process. Just like life, I have to learn to be flexible. "Blessed are the flexible for they shall not be bent out of shape." I have my lazy days. Admit it, so do you. But most days I am busy doing something. It isn't always rewarding, but you know what? I'm ok with that because I am doing what I love. But sometimes, when I get frustrated and, despite having a brand new Keurig, there's not enough coffee in the world to keep me going, I need to remind myself it's ok to take a break. When one of the kids throws a fit, take a break before trying to resolve the issue. When a fundraising idea for school doesn't pan out, take a break before thinking of ideas for next time. When I can't think of anything to write for one of the newsletters, take a break. Inspiration strikes at the least expected moments. When something in my shop isn't going as planned, take a break and regroup. The motivational gears will turn once again. I'm in one of those valleys where nothing seems to be going right. I keep trying to remind myself that it all goes in cycles and that things will eventually change. Love this. I have to takes breaks often, I have to have time each day to not think much, not worry about the to-do list, not worry about the laundry. To just chill and relax so that I don't get burnt out so quickly. When I get all wrapped up like that, I spend a morning like I am now, just doing nothing but blogging and catching up on the shows I've DVR'd. Then I jump up and get going again. It always works! Taking a break is such good advice- I really, really, REALLY need to keep that in mind. Things are in such a rough spot right now that everything seems to manifest itself at the worst possible times. The break concept can help in so many of these situations..